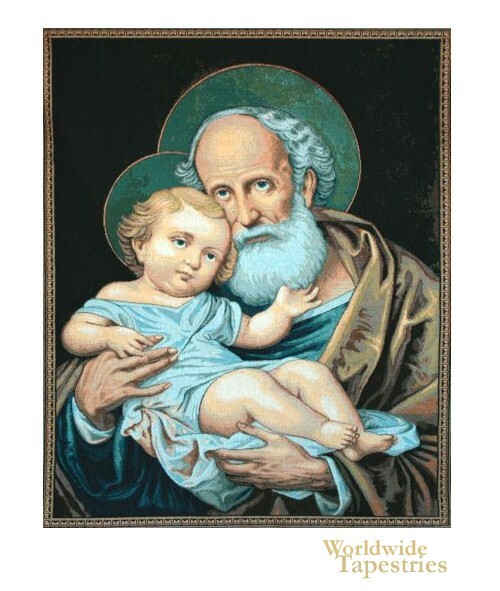 This religious tapestry "San Giuseppe (St John)" shows this famous saint with a child. We see him and the child with green and gold haloes to represent their pure and holy nature. Religious works such as this sprung forth since the Baroque and Renaissance eras as religious figures and events were considered a valuable and virtuous genre of art which provided much inspiration form their content and subject matter. This religious Renaissance art tapestry "San Giuseppe (St John)" is lined and has a tunnel for easy hanging. Dimensions: W 24" x H 30"